Over the course of 10 hours and 10 films, Krzysztof Kieślowski explores the nuances and potential moral gray areas of the Ten Commandments. Each hour dealing with a different commandment, this sprawling epic examines religious moral absolutes with an eye for their inherent contradictions and potential for missing the context of certain situations. As with any anthology, some segments are stronger than others, but the combined impact of the 10 films is staggering. 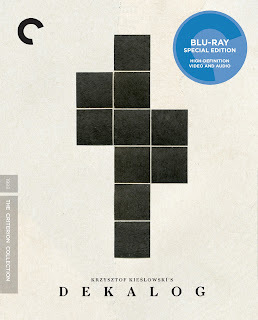 Connected only by one quiet observer (and one overlapping plot), Kieślowski's Dekalog is a towering achievement, one that takes an ancient code of morality and places it in a modern context in ways that are both surprising and thought-provoking. There's nothing else like it in modern cinema. Taken individually, each entry in Kiewlowski's Dekalog represents one of the Biblical Ten Commandments. In Dekalog I Kiewlowski explores the first commandment - "I am the Lord thy God; thou shalt have no other God but me" - through the eyes of a young boy, Pawel, and his father, Krzysztof, a university professor. Krzysztof does not believe in God, instead relying on science to provide all the answers of the universe. His sister on the other hand, a devoted Catholic, has a deep and abiding faith. After the death of his mother, Pawel begins to question the meaning of life and the existence of the afterlife, torn between these two figures in his life, before a tragedy and a possible message from beyond the grave changes everything. A woman whose husband is possibly near death, seeks absolution from his doctor, her upstairs neighbor. She is pregnant, it turns out, by another man - a man she intends to marry if her husband dies. If her husband is to live, she wants to have an abortion, but may sacrifice her long-desired ability to have children. That is the kind of moral catch-22 at which Kieślowski excels, but he goes one step further here. The doctor, as it turns out, suffered the loss of a wife and child in the war, many years ago. Dekalog II is a slow reveal, one that barely even acknowledges the Commandment on which it is supposedly based. And as a result, it's one of the weaker entries in Kieślowski's Dekalog II. But it does feature some of its most striking imagery. The shot at the end of the bee struggling to escape from a jar of compote as the woman's husband clings to life might be one of Kieślowski's most indelible visual metaphors. Otherwise, the emotional minefield at the center of this film feels strangely unexplored and even inert. "Remember the Sabbath Day, and keep it holy." At Christmas mass, a man notices a former flame in the congregation. She approaches him afterward, and implores him to help her find her husband who has mysteriously disappeared. Lying to his wife, telling her that he is going out to find his stolen taxi, he heads out into the night with his former mistress on a journey that will lead them all over the city in search of her missing husband. More than that, however, it is a journey through the past, and their own unrequited feelings for each other, living out the lives that could have been. Dekalog III constantly feels like it's about to fly off the rails, flirting with absurdity far more than any other of Kieślowski's films. As their night begins to take increasingly wild turns, the true nature of their outing is revealed, and it is here where Kieślowski begins to blend the Ten Commandments that give each entry in the Dekalog their theme. If remembering the Sabbath Day is the official focus, then why does it deal so much in infidelity? Dekalog III begins to masterfully blend the commandments together, synthesizing them into one beautiful whole. The intersectionality between them comes more sharply into focus in the third entry, showing how not keeping one commandment leads naturally into breaking another. And another. And another. Break one, and the whole system collapses. If the Dekalog is meditation on the Ten Commandments as a roadmap to life, then there is no greater argument for that than Dekalog III, one of the series' most potently crafted entries. The fourth film in Kieślowski's Dekalog examines the complexity of parental relationships through the eyes of Anka, a young woman who is tormented by an unopened letter left behind by her dead mother. One day, she forges a similar letter and shows it to her father, telling him that he is not her real father after all, and admits to a strange lifelong attraction to him. Dekalog IV takes the 4th commandment and turns it on its head, exploring the moral gray areas present beneath the moral absolutes espoused by the Ten Commandments. Kieślowski creates quiet drama out of potentially lurid subject matters, and imbues it with a kind of Freudian curiosity rather than sensationalism. It's a powerful meditation on ambiguity, things left unsaid, and what it means to be a parent. The fifth entry in Kieślowski's Dekalog is perhaps the most stylistically distinct of the ten films. Gone are the drab grays of the anonymous Polish apartments from the previous films, replaced by vivid green filters by the great cinematographer Slawomir Idziak. It's a striking contrast, and right off the bat we know we're in for something different, every frame awash in a sickly green than seems to throw everything off kilter. Dekalog V follows two men, one a young man accused of a random and senseless killing, and the other, his idealistic young lawyer who is crusading against the death penalty. We know the man is guilty of the crimes, and so does his lawyer. His struggle is against what he sees as yet another senseless crime, the slaying of the murder as revenge rather than true justice. Dekalog V is perhaps the most incisive film in the series, perhaps why it was expanded into its own feature film, A Short Film About Killing (also featured on the Criterion Blu-Ray). Kieślowski hauntingly explores the 5th commandment not just as an admonishment against the man who committed the murder in the first place, but as a condemnation of a state that thinks that two wrongs somehow make a right. Kieślowski would go on to significantly rework Dekalog VI into A Short Film About Love (also featured on the Criterion Blu-Ray), but in its shorter form here, it remains one of the highlights of the director's gargantuan masterwork. It recounts the tale of a teenage postal worker whose unhealthy obsession with a neighbor unexpectedly leads to a chance at love, until the encounter turns sour, flipping the film on its head as the jaded neighbor is forced to do her own soul-searching for her own understanding of love. Kieślowski has a knack for taking what seems like a straightforward morality play and turning it on its head, and Dekalog VI is no different. It plays on our expectations and prejudices to craft a nuanced portrait of romantic and sexual attraction. It arrives at quite a different conclusion than does A Short Film About Love, striking a much bleaker, less ambiguous tone in its final scene. But as is typical with Kieślowski, things are rarely ever as they seem, and he leaves Dekalog VI open to just enough interpretation to leave a question mark hanging over the end. Still, its outlook on love is hopeful, even if its view of human nature isn't. Dekalog VI understands that love can be just as destructive as it is healing, and its characters discover both sides in just under an hour. "Can you steal something that's yours?" Majka, the character at the heart of Dekalog VII asks, after having kidnapped her own daughter from her mother, who raised them both as her own after Majka became pregnant as a teenager. The seventh entry in Kieślowski's Dekalog is remarkable in its un-remarkableness, handling a situation not uncommon in cinema with a kind of quiet grace. Like the other films in the series, Kieślowski explores the moral grey areas in the Ten Commandments, and while Dekalog VII doesn't feature the same cinematic power of some of the films that precede it, there is a tenderness here that is hard to deny. The main character in Dekalog VIII is an ethics professor, which is apt considering that most of the Dekalog is centered on tackling ethical quandaries that arise from supposedly clear cut Ten Commandments. In her class she meets a young woman she turned away during the Holocaust, potentially sending her to her death in order to protect her own life saving operations. Her excuse? She was not willing to compromise her own religious values by lying. This is one of the most painfully complex films in Kieślowski's Dekalog. It's also the only one to directly reference any of the other films, using the plot of Dekalog II as one of the ethical issues discussed in the class at the beginning of the film. Most of the drama stems from conversation rather than action, but it's all so riveting. This is where Kieślowski's concept really shines through the most, where the lie at the center of the film becomes something that was good for many people, but bad for a certain few. Which was the right course? In the world of the Dekalog, the truth is never black or white, and in the eighth installment of his massive cinematic work, the truth can be equally beautiful and deadly at the same time. A couple's relationship is put to the test after he discovers that he is impotent and can no longer perform in bed. This leads her into an affair with a younger man, further pushing the man toward the edge. Dekalog IX starts out as one of the more internally focused of Kieślowski's Dekalog, but it ends up as one of the most harrowing of the ten films in the series. The moral dilemma Kieślowski presents us with feels more clear cut than some of the others (at least as far as exploring the fallacies of the Ten Commandments is concerned), but like most of his work, you understand the predicament in which the characters find themselves. It culminates in perhaps one of the best endings of the series. 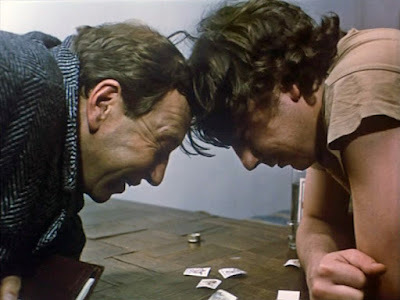 After 9 hours of misery and pain, Krzysztof Kieślowski ends his epic Dekalog with a comedic tale of two brothers who are out to complete their late father's stamp collection, plunging them headfirst into the cutthroat world of stamp collecting, with increasingly high stakes results. Kieślowski finds great comedic traction in the ridiculousness of their plight, but also manages to reach an emotional denouement that brings the entire series to a satisfyingly hopeful close.